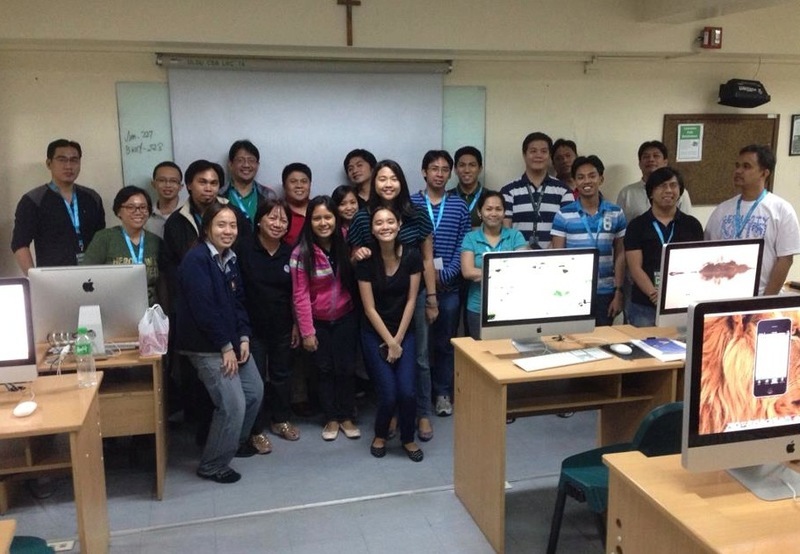 Over 10 schools participated in DevCon Mobile Camp: iOS (Educators Edition) held last May 11, 2013 at the Mac Lab of De La Salle – College of Saint Benilde. The camp was a whole day seminar and workshop that provided an opportunity for the educators to be equipped with the fundamentals in iOS development. DevCon or Developers Connect Philipines, a non-profit organization that aims to promote the talents of IT community, believes that educators play a key role in expanding technical capabilities. And the iOS development platform, an industry that has an exponential growth in demand, is a good start. The camp started with an opening remarks by Haifa Carina Baluyos, Executive Director of DevCon followed by Paul Pajo, Developer Evangelist of SMART Developer Network (SMART DevNet), who shared about the state and opportunities in iOS development in the industry as well as SMART DevNet’s involvements for the growth of the IT community. Jorge Azurin, Country Manager of Freelancer.com, also gave a talk on freelancing opportunities and how it makes a difference. The workshop proper was led by Michelle Ang, iOS developer and Lead Marketer of Tecsoft Apps, where the participants were first oriented with the Xcode user interface followed by creating simple elements and functions to produce a simple application. At the end part of the camp was a mini-hackathon where participants were to create an iOS application that provides a portal for their school’s basic information. The winners of the mini-hackathon were Rommel Bulalacao of University of the Philippines – Los Banos, Briane Paul Samson of De La Salle University – Manila, Jobert Bravo of Colegio de San Pedro, Roman De Angel of Far Eastern University – East Asia College and Maynard Moreno of University of Perpetual Help System Dalta – Las Pinas. DevCon Mobile Camp: iOS (Educators Edition) is a partnership event of Developers Connect (DevCon) Philippines, De La Salle – College of Saint Benilde and SMART Developer Network (DevNet). The camp is also supported by Freelancer.com and Accenture Philippines.